At sixteen he began his studies in music at the Escuela Libre de Música de Arecibo, specializing as a Violist; with Héctor Mercado Chapman. Given his potential, he became Principal Violist in the Youth Symphony Orchestra of ELMA (Escuela Libre de Música de Arecibo) and was recommended to participate in several orchestras such as the Youth Symphony Orchestra of EAM (School of Arts of Manatí) the OSJPR (Youth Symphony Orchestra of Puerto Rico) and was also a participant of "Programa 100 X 35" directed by Venezuelan violinist and director, Eddy Marcano. 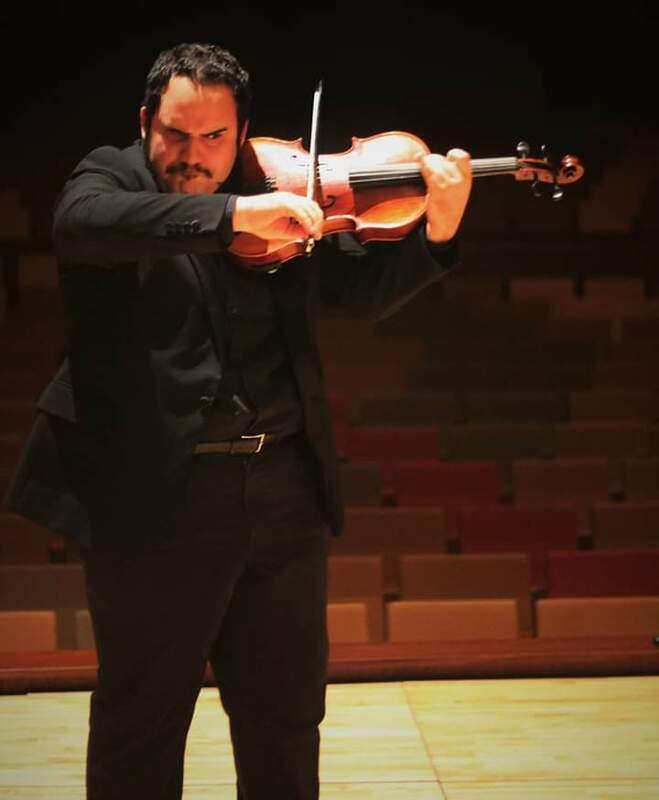 The young man finished his courses in the Escuela Libre de Música with Academic Excellence and won the "Scholarships for Talented Young People by Jennifer I. Pérez" and entered the Conservatory of Music of Puerto Rico in 2013 for studies on the Bachelor's degree in Viola Perfomance. Edwin has participated in a lot of Student Concerts as a Soloist and as a prominent Chamber Musician at the Conservatory of Music since his admission and has shown versatility in collaboration with Popular Music/Jazz at the InterAmerican University of Cupey. In the summer of 2015, Edwin was a participant in the Nuevo Mundo Music Festival of Aruba and got classes with the Vermeer Quartet Violist, Richard Young and he also had a participation to collaborate with the Youth Music Association Youth Orchestra now known as "One World Symphony Orchestra" in Ashburn, Virginia. The Violist also participated in the First String Camp of the Pontifical Catholic University of Ponce as Principal Violist of the string ensemble of the camp, and as a Chamber Musician where he obtained master classes and private lessons with Dr. Joel Pagán (Professor of Viola , University of Texas Rio Grande Valley and Principal Violist of Laredo Philarmonic) in summer 2016. In the beginning of August 2016, Edwin made his debut in France, representing Puerto Rico at the 2016 Casals Prades Festival where he participated as a soloist in the student concert. He has taken private courses with Professor Bruno Pasquier (Professor of Conservatoire National Supérieur de Musique de Paris and the École Normale dé Musique de Paris "Alfred Cortot") and also with Hartmut Rohde of Universität der Künste of Berlin. On June 10, 2018, he completed his Bachelor's Degree at the Conservatory of Music and also as Principal Violist (Collaborator) at the Symphony Orchestra of the Conservatory of Music of Puerto Rico (OSCMPR). Edwin was accepted and participated recently on summer in Fresno, California with FOOSA Philharmonic directed by Thomas Loewenheim where he obtained lessons with Michael Chang (Viola Professor at Fresno State University and California State University) and Adriana Linares (President, Founder and Artistic Director of ArCoNet, The Arts & Community Network) In addition to his participation as a Chamber Musician at Sierra Music Academy in Mammoth Lakes, California where he obtained private lessons with Jaime Amador (violist of the acclaimed Harlem Quartet), Nokuthula Ngwenyama (recognized 1st prize Violist in the William Primrose Competition and president of the American Viola Society) and Theodore Kuchar (acclaimed violist and director of the Janáček Philharmonic Orchestra) where the young violist has shown good performance and skill in his master classes and Chamber Music concerts.